Strong, hardy and sometimes gruff, the dwarf is the mainstay of any adventuring group. As quick to appreciate architectural beauty as he is to charge screaming into battle, the dwarf is not as easy to judge as he may first seem. 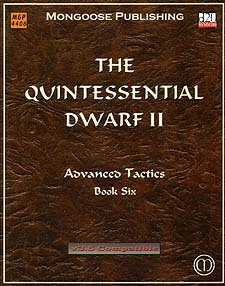 The Quintessential Dwarf II: Advanced Tactics aims to explain some of these contradictions as well as expand on the mythology behind these bearded warriors. With the help of this sourcebook, any character choosing to play a dwarf will find many alternatives and options for expanding his range of abilities. With Career Paths, dwarves can customise their advancement and gain special benefits from their chosen branch of training. The Legendary Dwarf offers a subset and expansion of their combat prowess that may take them to epic-levels and beyond. Multiclassing offers a dwarf a complement to his abilities, while Superior Tools can enhance his performance. The Magical Dwarf explains the dwarven concepts of dolmen construction and ancestor worship, while Special Techniques offers a range of new fighting styles. Dwarven Engineering details the race's methods of craftsmanship and construction while The Clan explains the interaction between caste and family. Finally, Survival Tactics details the advantages and disadvantages to portraying a dwarf in your game.